The British Museum has a large collection of beads on display, some of which are extremely beautiful and unique. One of the beads is the one they call a 'magical' bead, attributing to it several different properties. Found in 1860, it was found in the grave of a woman along with several amber beads, one of which was found in the right hand of the body. The large was originally thought to be a spindle whorl but the shape of the bead and the style are against that interpretation. It does have an exotic allure, the light coming through the transparent cobalt blue glass can appear as anything from a pale blue to a deep purple. 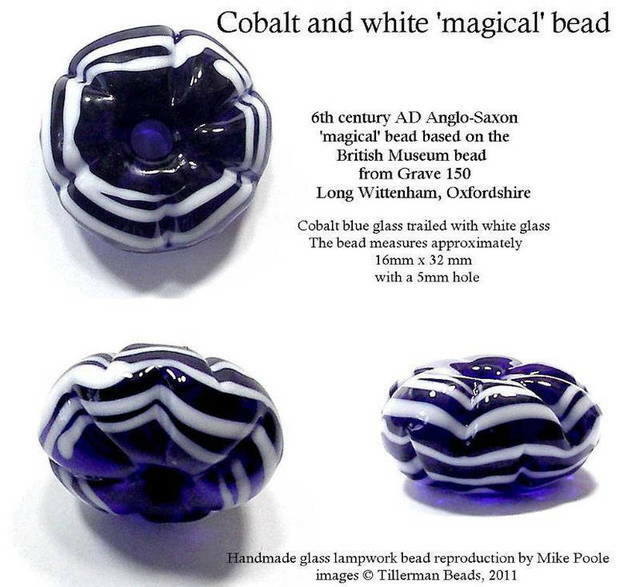 The picture shows three views of the bead, the light coming through the transparent blue glass is clearly visible. Whatever the original use for the bead, it certainly holds its attraction, tactile and beautiful as a piece of art on its own. 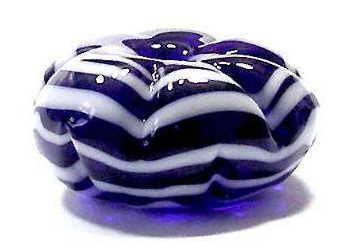 The reproductions are handmade by Mike, of cobalt glass trailed with white and then shaped into the 'bun-like' form with six indentations on each side of the bead that alternate to give it a lovely, folded look. The bead measures approximately 16mm x 32mm but will vary slightly as each one is unique and individually made. The listing is for ONE bead, the picture shows three views of the same bead.